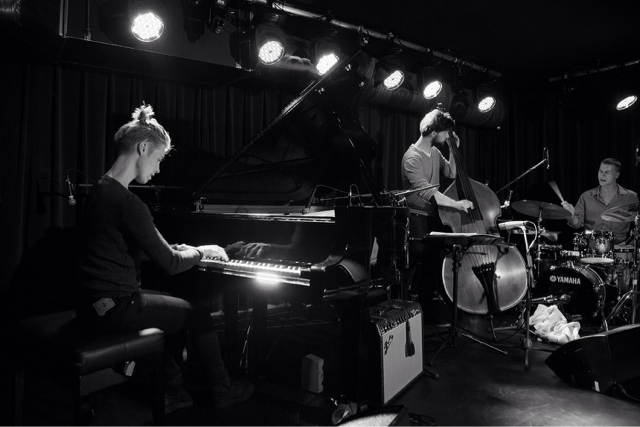 The first time I listened to Julia Kadel Trio was April 2015 in Bremen - at one of jazz showcases of Jazzahead. I expected a nice performance but what they had done on that day, exceeded my expectations and I was tempted to get their debut album from 2014, Im Vertrauen to write a review. The album sounds amazingly mature compared to a debut of such young musicians and the taste which stayed in my ears reminded me of old and nice feelings I get when I listened to very experienced European jazz trios. Structured on strong jazzy textures, influenced by classical music -carrying also pop traces- and performed in an improvisational and classy way, the pieces composing the album are like successive parts of a complete story. In my opinion, the technique is more dominant in the presentation compared to the content; but the energetic spirit the musicians spreading through their instruments enriches this content. They do not seem to be caring a lot for the audience to be caught at the first note but instead, they straightly play what they want without trying to stand only by melodic compositions. Besides improvisations and a piece by Karl-Erik Enkelmann, the compositions belong to Julia Kadel. The title track is the first one and it sounds like a state of full trust - as reflected in its naming. The idea seems to be giving the main improvisational leadership to the piano and letting the drums and the bass to concentrate on the tension control. A very clear and inquisitive piano riff is followed by a very cultivated bass solo accompanied by minimal piano touches and drums in the introduction of Fragen. Thereafter, we faced a main theme of ever-increasing tension and volume, which changes place with the introductive piano-riff and its derivatives again later on. Innendrin is a complete improvisation and its main character is heartbeat-like bass rhythm showing the way to the rest of the trio. The piano talks just a little; but what/how it says is impressive. An ordinary but very well performed -let me say- European jazz trio rhythm line is once again driven by a dark but melodic piano line in Zweifünfzig. Bass solo is impressive with its string-pulling sounds. The dynamic tensional state and rhythm throughout the piece makes it something very joyful to follow. The disappearance of the bass and drums to let the piano fly freely and their return for accompaniment are all very well designed and they really sound like a trio playing together for some ten years. As can be easily seen from Regentag, the trio has a style and the album has a story. A story which is complete and well sorted in terms of its events... Julia Kadel's performance is impressive in this comparisingly long piano partitions. Composed by the bassist Karl-Erik Enkelmann, Die Behauptung is very attractive with drummer Steffen Roth's nice performance -after a very long almost silent introduction- accompanied by minimal but very touchy piano and the double bass played with bow. Started with a dark tone and shuffled into many energetic parts, the piano is like a reflection of a surprising state of mind in Nicht Bleiben. Another complete improvisation, Vorwärts shows us how successful these musicians are at listening to each others. A very impressive and naive piano solo introduction turns out to be a nice trio performance in Aufwachen. A mystic aura is spread to the living room with Vorbei -while the double bass is performing both from the bow and the string, and the soft piano is being accompanied by hand strokes to the toms. The album ends with three fully improvisational pieces. Although written as a trio improvisation in the liner notes, piano starts like playing a well-known and melodic solo line in Alles Wollen. 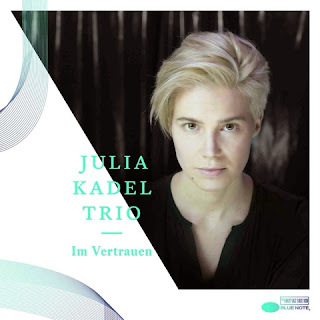 Julia Kadel proves the virtuosity here with a complete solo improvisation. I am sure listening to a solo album from her would be very joyful. Leise Schritte starts as a very spontaneous act and thanks to the nice follow achieved by the piano for the drum and bass, this improvisational performance tied into a very nice and collaborative one. Tropfen is based on the minimal bass background created by the strokes of the bow to the strings. The piano and drums are giving so little contribution to this mystic aura, leaving the listener in an empty state of mind at the end of the album. This is surely a fantastic end for such an album. The album was produced by well-known German drummer Eric Schäfer and the album was released by Blue Note. The album was recorded by Jean-Boris Szymczak at Studio P4, Berlin. Mastering is achieved by Götz-Michael Rieth at Eastside Mastering Studios. The sound design seems to be very well achieved letting the musicians be listened to transparently. Especially for hearing the nuances on the bass, I can certainly make that claim. Nice but not so well recorded.